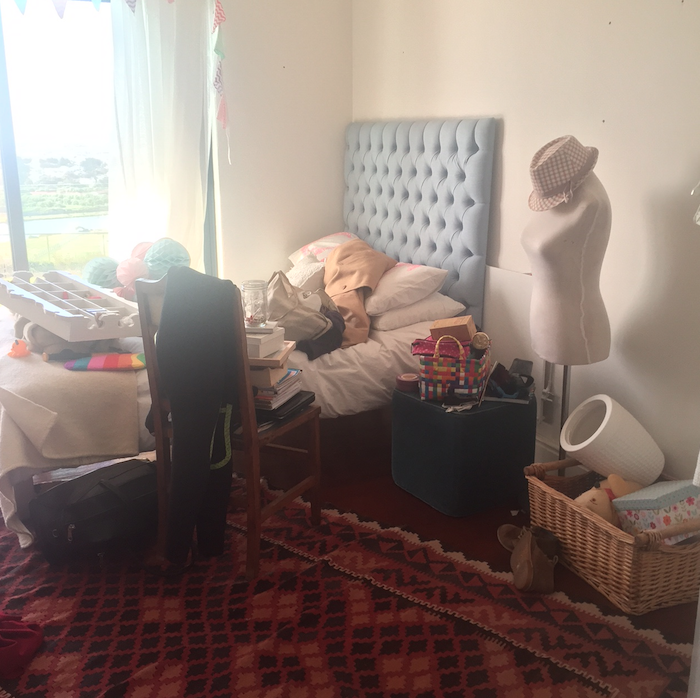 This is what the bedroom looked like on Saturday morning – at this stage i was NOT feeling confident about making it over at all! The beech wood shelf came from Simply Home and is a beauty – i think it makes the room. To fulfil the ‘lots of plants’ brief, we went to Stodels on the weekend and bought loads of plants and terracotta pots – i’ll be sharing a more detailed plant-specific post later this week about how we approached greening our home and especially for this current makeover mission. I found the wooden hand at MrP Home and the cactus print and cushions are all from Skinny la Minx. The framed print on the wall is from Essie Letterpress – it was originally framed for Charley’s room but the whole vintage print thing is so Chloé, i gave it to her. I changed the mint green curtain rail for a simple pine one from Builder’s Warehouse – it was as cheap as chips and in keeping with the plain wood brief. 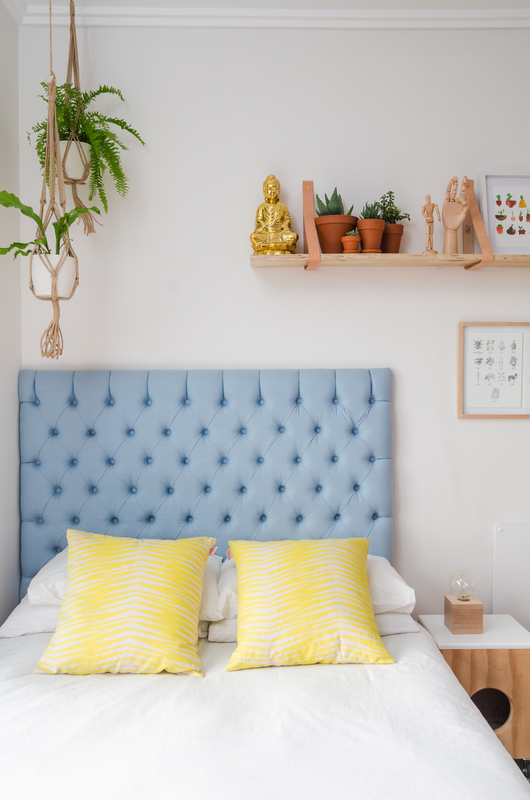 A few of you have asked about the headboard over on my Insta feed – i had it made a few years ago using a beautiful sky blue linen from St Leger & Viney. 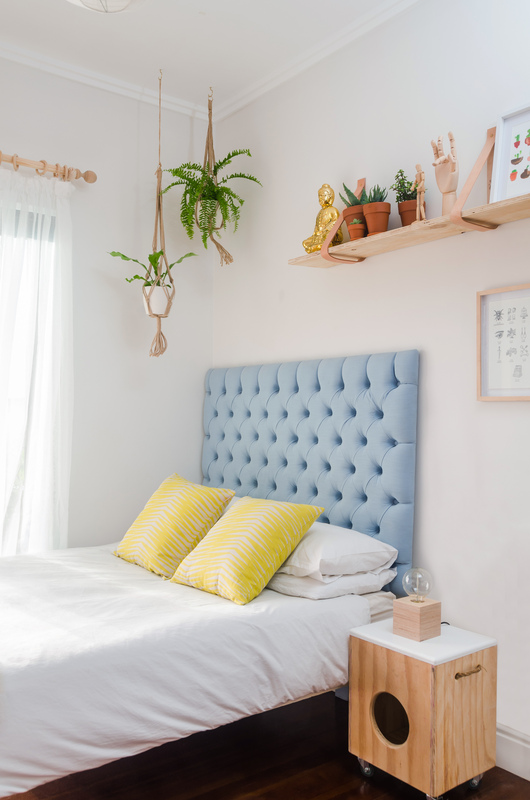 Chloe wanted a different colour but budget didn’t allow for it (you’re looking at anything from R1500 upwards to have a double bed headboard made at an upholsterer) and i was very worried the colour wouldn’t work but i think it does! The side table box was found on Gumtree (I’ll be posting a Gumtree specific post tomorrow) and we upcycled it by painting the lid white and adding castors – i love it and so does she. Isn’t the little lamp on the sidetable fab? It’s another find from Mono.I bought the macrame plant holders in December at Mr P Home with a view to using them for myself but didn’t get round to planting them up, so the brief and a subsequent shopping expedition to Stodels was the perfect opportunity to fill them. This is Chloé’s desk, i bought it years ago and painted it and this weekend we repainted it bright white. The gold baskets were a spray job and took less than 20 minutes to transform from a galvanised steel to glam storage. I am a sucker for a cork pinboard and this lovely one is from Mono, who as you know are one of my favourite South African decor stores. More on the upcycled lamp (which i am very proud of, i might add) on the Gumtree upcycling post but what i can say is that Hoi Ploy did such a fabulous job of making my upcycling plan come together! 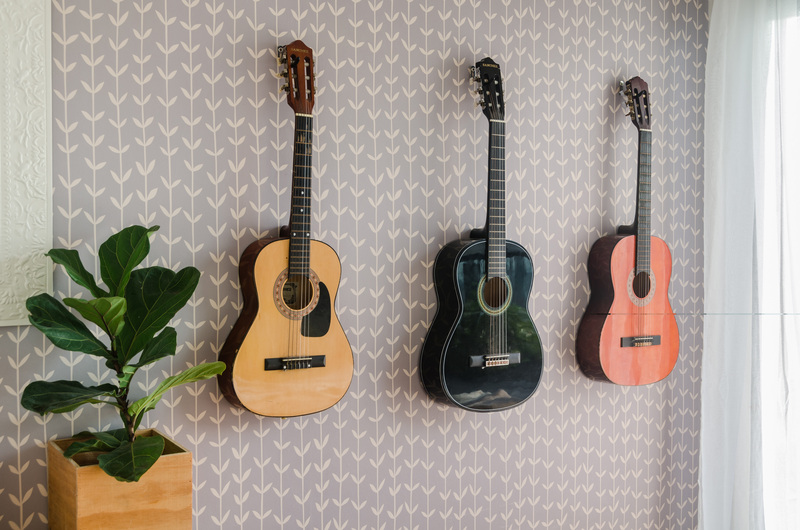 The guitar hooks were Chloé’s idea and i love them and they keep the damn things off the floor! She is a talented musician and song writer so they suit the room and her personality perfectly. The fiddle leaf fig came from Chloe’s Granny who is a garden designer and who bought my one for me for my birthday. We originally planned to pop it into a Simply Home belly basket but it was too big, so i fished out a pine box that i had lying around and it fitted perfectly – if you’re looking for Fiddle Leaf Figs, Stodels is getting stock in September. Do you remember how cute the Skinny la Minx Orla wallpaper looked in Charley’s room? 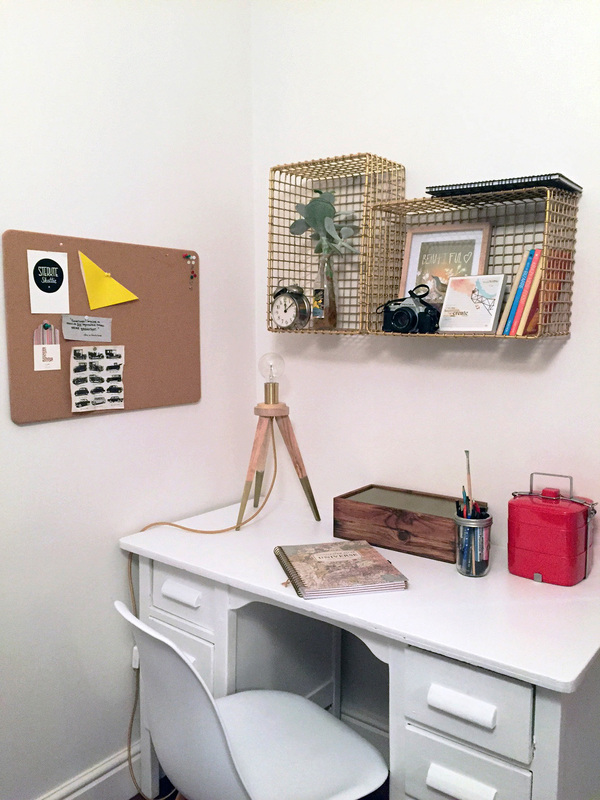 Well, i’m so pleased to see how versatile it is in a teen’s room too! Chloé was originally very sceptical about my insistence on her keeping it but she loves it and it’s such a lovely motif for a plant crazy girl! So there you have it lovelies, a new room for the oidest teen in our lives. It was created with much love and i hope she enjoys it! Thanks Bryan Viljoen for the fabulous pix and for agreeing to shoot at the crack of dawn! PS. I’ve published a bunch of recent winners on the I Want That Facebook page – hop on over to see fi you’ve won something! You have done such a great job, looks amazing! This room is stunning! Thank you for the post, it’s definitely what I needed to motivate me to upcycle rather than buy a whole bunch of new things. You are a clever clogs. Beautiful Vix! !